Volusia County, FL is bordered on the east by the Atlantic Ocean and the west by the St. Johns River. The landscape is formed from a series of beach ridges and terraces that accumulated tens of thousands of years ago when sea level was higher than it is today. The western part of the county is covered by the deep sandy soils of the DeLand and Crescent City Ridges. Numerous large lakes also occur in the county, mostly on the western sand ridges. The central part of the county is flatter, with low pine and oak forests. East of this are the dunes and beaches of the Atlantic coast. The St. Johns River and its lakes and marshes provide a rich variety of habitats and animal resources that have sustained human populations for over 5000 years. Water from the chain of lakes (including Lake Monroe) that form the upper reaches of the St. Johns flows slowly northward to replenish the lower portion of the river that is, in essence, an extensive estuary. Before deforestation, diking, and ranching by humans began in the early 1900s, all but the northernmost 50 miles of the 200-mile-long river basin was freshwater marshes, swamps, and lakes. 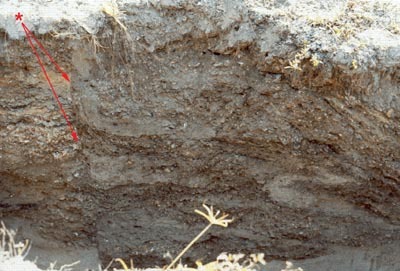 Studying archaeological soils adds a unique perspective to the interpretation of the site, and completes the reconstruction begun by the analyses of plant and animal remains and cultural materials. The soil chemical changes that always accompany human habitation are invisible to the eye, and the physical changes that past settlers may have made are buried beneath the soil we walk on today-hidden away from even the keenest observer. But these changes are a vital part of the site’s story and sometimes turn out to be the most direct evidence of site features, layout, and overall size in places like Florida, where the warm climate and abundant rainfall degrade site materials over time. Here I outline two very intriguing findings-one archaeological and one modern-that illustrate how we use soils studies to understand how humans alter their surroundings through time. The colorful and oddly shaped subsurface horizons in the soils where the lithics workshop was found [Fig. 2] are naturally occurring and not unusual. They formed under the influence of a complex set of factors including ground water fluctuation (wetting and drying cycles), the chemical composition of the microscopic clay coatings on sand grains, and tree-root effects on the chemistry of the localized soils. The gaudy, contorted subhorizons were unexpected and surprising to see, but they were not formed by any unusual or catastrophic disruptions of the soil in that area. The interesting thing about these colorful soils is what is not in them. In fact, the unique finding of this study is the strong contrast between the enriched soils of the general midden areas and the very low levels of all chemical elements throughout the lithics workshop area. Most archaeological soils are enriched in elements like calcium (contributed by the breakdown of shell and bone from food animals) and phosphorus (from the bone and discarded soft tissue of animals). 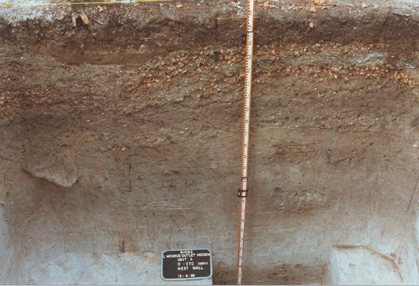 The larger the population that inhabited the site, or the longer they inhabited it, the higher the content of these soil elements. This study found that the lithics workshop was not only located physically apart from general living areas, but that the specialized production of lithic tools was not intermixed with other daily activities such as food preparation or storage. The differences between chemical signatures of the general midden areas and even the outlying units compared with the workshop are extraordinary: there is a kind of ‘clean room’ effect, as if no one were allowed to drop a single shell or bit of refuse in the vicinity of the workshop. 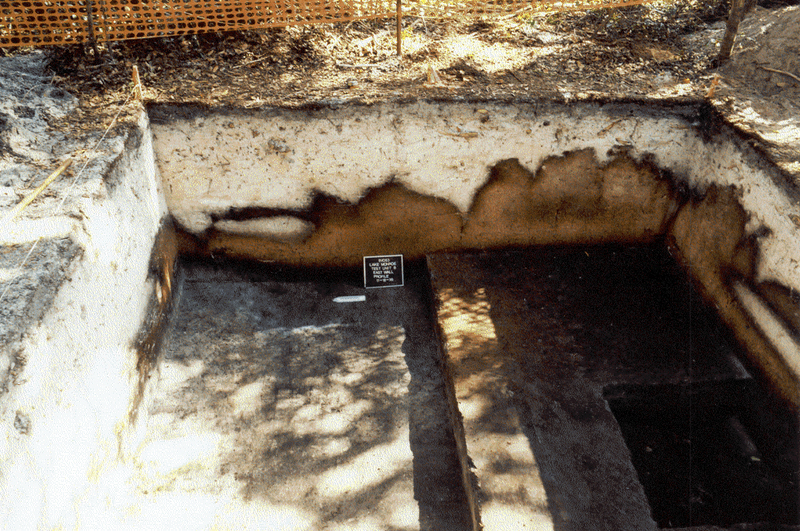 Studies of other Florida Archaic sites have also found a negative correlation between chemical enrichment and lithic artifact counts, but those studies were limited by small test areas and the lack of any middens or other domestic features in the vicinity for comparison with the lithics features. For this reason, the Lake Monroe results are an especially valuable contribution to the effort to quantify the observation that lithic workshops are situated apart from household areas in Florida Archaic sites. Once these differences have been recorded for a number of sites and we can see patterns emerging, we can begin to unravel the “why?”. Why was this activity so guarded from day-to-day activities? (Does it have to do with the rarity of lithic resources in Florida?) Is this pattern found at older sites? Younger sites? In cultural traditions outside of Florida? A curious vertical ‘fault line’ was found in one of the excavation trenches and prompted much on-the-spot speculation about its origin. It appeared as an abrupt ‘discontinuity’ or thin line that separated roughly matching sets of strata on either side. [Fig. 3] Here is a “best guess” as to what produced it (you may have other ideas…). First, it is clear that the split occurred long after the midden layers were deposited-it couldn’t have separated layers that weren’t there in the first place. Because there are matching but off-set strata on each side of the ‘fault’ with a clean line between the two faces, whatever separated the two sides must have been only slightly disruptive (not like a large bulldozer cut). Because the colors of the two sides vary-one side is bright, the other dull and grayed-the separation must have been complete for a while, and the duller side exposed to weathering and increased moisture long enough to produce the grayer color. For this reason, there couldn’t have been a literal ‘fault’ between the two (like the San Andreas Fault in California), with the two faces simply sliding against one another. If that were the case, the colors would not have changed. The eventual re-joining of the two sides resulted in one side being lower than, or angled into, the other. One scenario that would explain all these elements is a narrow back-hoe trench (possibly dug during highway construction or expansion) separating the two halves and breaking the connection between the two for long enough that the southern, downhill side became more weathered and saturated because it was closer to the lake. Later the south side either slumped against the north side, bridging the small gap between the two, or was pushed back. (The south end of the trench profile shows some crumpled and compressed strata that may have been compacted by heavy machinery.) Since the ‘fault’ was accidentally discovered and not part of the original investigations, no further testing was done to unravel its true origin, but it provided an opportunity to use our observations to come to a logical conclusion about a strange-looking find.